Our children are quite tired of hearing the “Dave Ramsey NO” But that is what you say when you get serious about paying off debt. All joking aside, we really don’t blame our frugality on Dave Ramsey (too much). My children love him as much as my husband and I. They sit through his financial peace courses and spend hours listening with us to his radio show. We cannot even play a game of Monopoly without his name or the term “emergency fund” being brought up. Our prayer is that our children are “getting it” and learn from our mistakes when it comes to finances. Of course I am still learning and have a long way to go. But what I have learned is that one of the most important aspects of paying off debt is making a budget and sticking to it. A few weeks ago we took a vacation to Gatlinburg, TN. Let me share 10 things we did to help stay on budget. Set the Budget – I know, it is obvious that to be able to stay on budget you must first set a budget. But just because something is simple doesn’t mean that it is easy. After making the decision to go on vacation the first thing to do is set a budget. Vacations need to be cash flowed. If you have a credit card (which I hope you do not) do not even think about taking it. The envelope system works great for vacations. Go Off Season – As a homeschooling family we do have the unique opportunity to take our vacations during off season. This has saved us a ton of money. On this trip we stayed in a beautiful two bedroom cabin for $29.00 a night with a small cleaning free. It doesn’t get much cheaper. We have also saved money by going to the beach off season. Our favorite time of year for a costal trip is in October. It is still warm enough for the children to swim and most prices are slashed in half. Plus you miss all the crowds and that is a huge plus for us. One year we went to Sea World the week before school was out. We had the place to ourselves. It was wonderful. I am not sure what my children would do if they had to stay in long lines for rides. Of course, there are some disadvantages to going off season like limited shows in places like Branson and Gatlinburg. However, we are very select in seeing shows anyway, so this does not affect our vacations. Get a Cabin or Condo – One or two nights in a hotel is fine, but any longer than that with a family is not my idea of fun. There are many benefits to staying in a cabin or condo. The first is that you have much more room. Our $29 a night cabin slept 6. Imagine trying to fit a family into a small hotel room for the same price. In addition, we always pick cabins and condos that have full kitchens and laundry rooms. Just watch for hidden charges like cleaning fees and non-refundable deposits. Those can add up if not careful. Our favorite resource for finding great deals is www.vrbo.com (Vacation Rentals by Owner). We have had good results by dealing directly with the owner. One Christian owner waved the non-refundable deposit for us when she discovered my husband was a pastor. BYO Food – We love to eat out while on vacation, but 3 meals a day can get very expensive. I have discovered that I can buy a week’s worth of groceries and snacks for our family of 5 for about the same cost of eating out at a sit down restaurant 3 times. In our vacation budget we plan on eating out as we travel to and from our destination and buying groceries during the week. Occasionally we will eat out during the week depending on where we are and what we are doing. Play Games Together – Vacation is all about relationships and memories and neither cost money. Some of our favorite memories have been playing a game in our cabin or condo together. Last summer we played a new card game called Golf. This trip our game of choice was Farkle. Look for Free – Not everything cost money. We spent one morning hiking on the beautiful trails. It didn’t cost us a dime and we have some wonderful memories and breath-taking photos. We spent the afternoon window shopping in downtown Gatlinburg. We spent less than $10 at a coffee shop. A simple internet search will suffice when looking for free activities. Do the Reviews – Again, a little research and planning can save tons of money. I spent some time on Trip Advisor looking at reviews. It helps avoid falling into the tourist trap and paying for something not worth the money. We also asked the locals for advice on cost saving activities. Skip the Extras – After doing the reviews, asking around, and finding a coupon, we decided to take the children to WonderWorks in Gatlinburg. We had a great day and were not disappointed. But remember, after you pay to get in, there are always extra cost. We did not buy food there. We did not pay for laser tag. We did not buy the cheap tourist photo. We ate at the cabin. We saved laser tag for another time. And we took our own pictures. To save money, skip the extras. You won’t miss them. Take a Tour – Okay, I admit. We did not take a tour. However, we did get offered one. Had we decided to take a 2 hour tour we could have gotten 5 tickets to the Aquarium and a dinner and show for $100. That’s a pretty good price savings of over $300. We passed this time. But, if you are willing to go through the tour and have the will power to say NO to pushy salesmen, then why not? If you are going to spend the money on the activities anyway, it couldn’t hurt. The last time we were in Branson we were offered a $100 visa card to take a two hour resort tour. Again, we passed. (It was, after all, our 20 year anniversary and 2 hours of our precious time was too much to ask.) But, when you do the math on it that is $25 an hour per person. Not bad money to make on vacation. Just a thought. 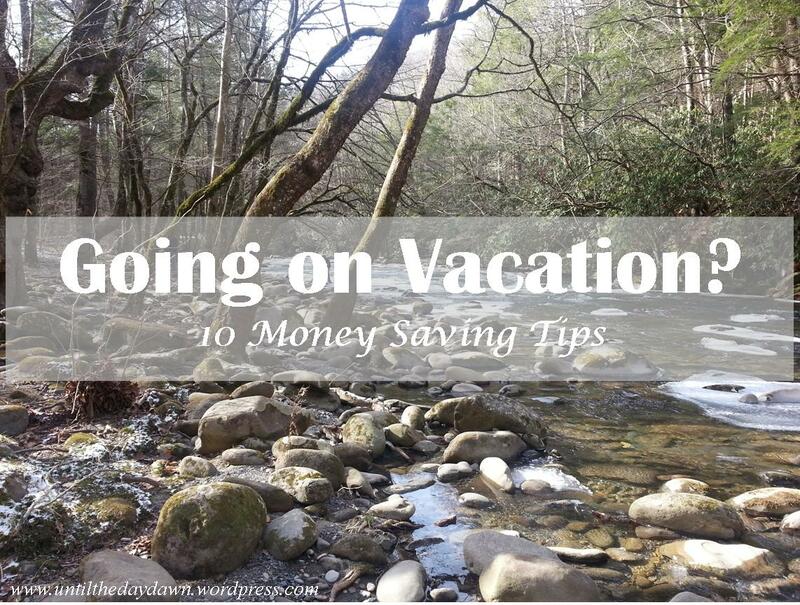 So, there you have it – 10 money saving vacation tips. When it comes to spending our hard earned money we need wisdom. So to go with the 10 tips, here are 10 verses of wisdom to apply with them…..